Identify the drive you plan to remove. Use the Ready to Remove indicator. See Diagnostics LEDs. The exact commands required to take the drive offline depend on the configuration of your drives. For example, you might need to unmount file systems or perform certain RAID commands. One command that is commonly used to take a drive offline is the cfgadm command. For more information, refer to the Solaris cfgadm man page. If the drive cannot be taken offline, shut down the Solaris OS on the server module. See Shut Down the Oracle Solaris OS. Verify whether the blue Drive Ready LED is illuminated on the front of the drive. See Diagnostics LEDs. The blue LED will be illuminated only if the drive was taken offline using cfgadm or an equivalent command. The blue LED will not be illuminated if Oracle Solaris was shut down. Push the latch release button on the drive (panels 1 and 2). 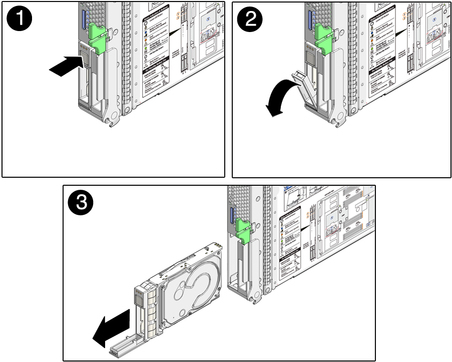 Grasp the latch and pull the drive out of the drive slot (panel 3). Insert a drive filler if you are not replacing the drive in this slot. See Install a Drive Filler.